Aloha All! 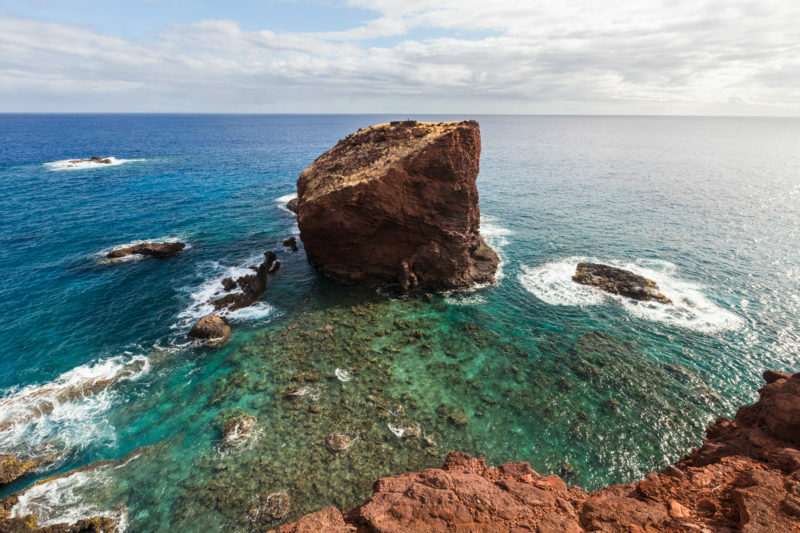 For those of you stopping over to Lanai for your vacation or even a day trip from Maui, make sure you put Puu Pehe on your to do list. This place is magical! As ancient legends often are, Puu Pehe tells a bittersweet story that ends in tragedy. Princess Pehe of Maui and warrior Makakehau of Lanai were young lovers and Makakehau had Pehe stay in a sea cave in order to stay hidden. While away, he noticed a strong storm coming in that would hit this side of the island with large surf. He rushed back to the cave, only to discover that he was too late to save his love. The story goes that Makakehau managed to scale Sweetheart Rock with his lover’s body and built a tomb for her before plunging 80 feet down to his death in sorrow. A heartbreaking story to be sure, but the view here is wonderfully heart-stopping. Plus, it will only take you about 45 minutes from the Four Seasons Resort Lanai to Puu Pehe. The hike itself is gorgeous and you’ll find yourself stopping often to take a photo. Extra Tip: Don’t have time to do this hike? If you’re traveling between Maui and Lanai by ferry, take a look outside! You’ll be able to see Puu Pehe from the ferry. The closest you can get to Puu Pehe (on land) is this Malauea cliff vista. From here you’ll be able to see what legend refers to as Pehe’s tomb, although it has been proven that no human remains exist up here. What they found instead were plenty of bird bones, which some suspect the rectangular “tomb” to be a bird heiau. Extra Tip: This spot is also the perfect place to see the spinner dolphins that often visit this area. Keep a lookout for them! The water here is usually so clear that you’ll also be able to see plenty of fish and turtles swimming about. The best time to come here is during the sunset for an amazing view. The rocks here are a deep red and the sunset draws the warm red tones out beautifully. And if you’re looking for a wedding location, this spot is quite popular for destination weddings (despite the irony). The waters below are a blend of blues and greens and the sky seems to stretch forever. Shark’s Cove, which is the tiny bay right next to Sweetheart Rock, is a fantastic tiny beach that is difficult to get to. There is not easy access from the cliffs down to the sand so most people who do come here are lucky enough to have access to a boat or walk on over around the cliffs. Extra Tip: If you do get the chance to visit Lanai’s Shark Cove’s sandy shore, be sure to sift through the sand because this is an awesome place to look for beautiful shells. 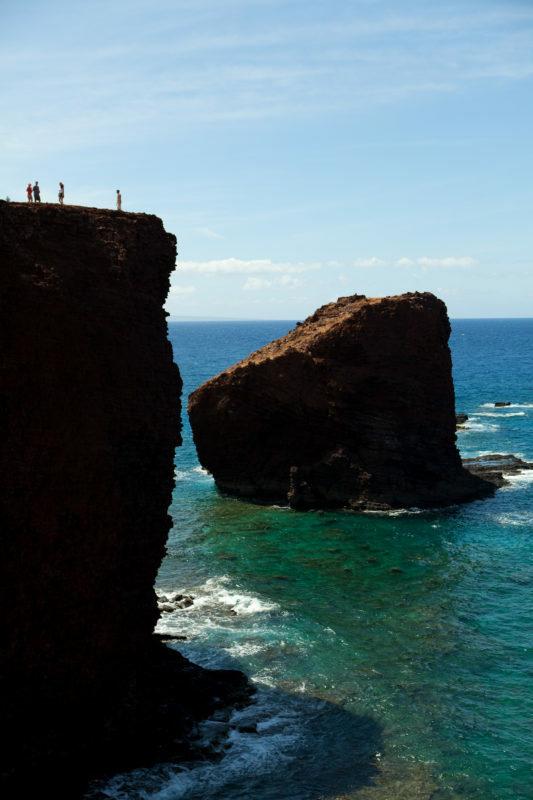 If you’re loving Lanai’s famous landmarks, check out Shipwreck Beach! You’ll get an amazing view there and will see some ancient Hawaiian petroglyphs! 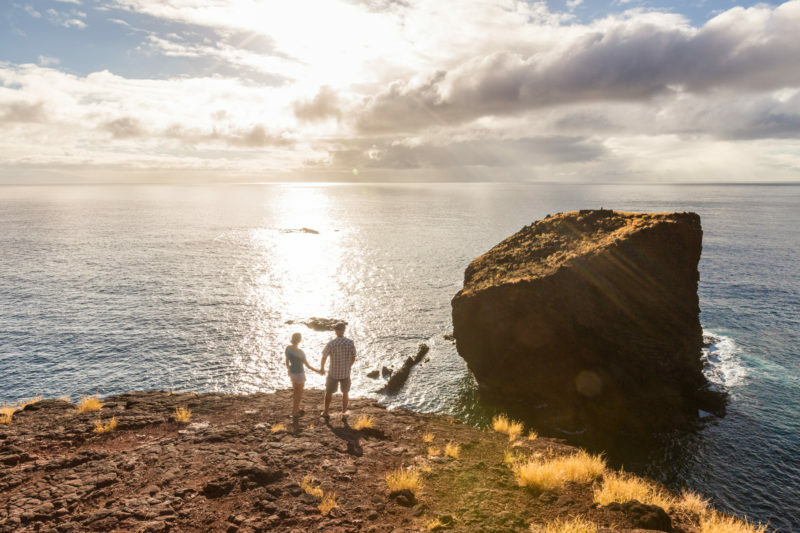 Raft Expedition to Lanai: If you’re on Maui, you have a great chance to explore a little of Lanai and snorkel, play or hike to Sweetheart Rock. Perfect for those who want a small taste of that next island they can see on the horizon. The boat ride is super fun, too! Only One Hour In Waikiki With So Much To Do!